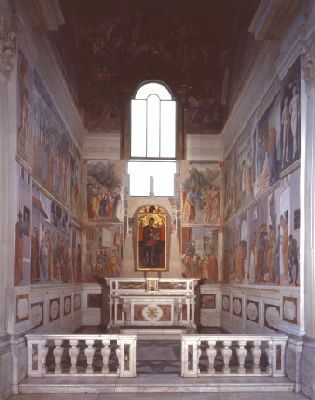 In the Church of Santa Maria del Carmine is housed one of the highest examples of painting of all times: the frescoes of the Cappella Brancacci, painted by Masolino and Masaccio and, after the latter’s death, completed by Filippino Lippi. The church and the convent of Santa Maria del Carmine were built as the seat of the Carmelite friars in the second half of the 13th century, thanks to the testamentary bequest of Cione di Tifa di Rinieri Vernacci, father of Petrello, the Ghibelline who, in 1279, signed the peace treaty with the Guelphs in the old piazza. The construction of the church, overlooking the spacious piazza, had its beginning in 1268 and was concluded a good two centuries later, in 1476. 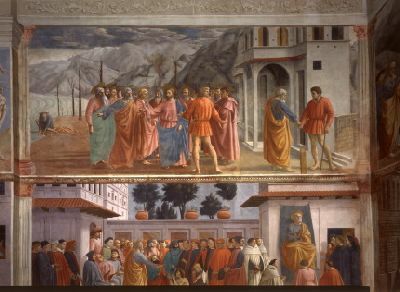 Masaccio had depicted the church’s 1422 consecration in the cloister, but the fresco, also known as La Sagra, was lost, probably during an architectural renovation between 1598 and 1600. The church presents a medieval structure and generous traces of its Romanesque gothic origin are preserved on its sides. The aspect attained in the second half of the 1400’s remained unchanged for at least a century, with the bell tower (reconstructed after a fire in 1771) and the unfinished façade as we see it still today. Many architects participated in the work but the paternity of the original drawing is traditionally attributed to Arnolfo di Cambio, or to his disciple, Master Lapo. Once completed, the majestic complex and its maintenance were entrusted to the Carmelite friars and to the rich families who had obtained the patronage of the chapels. The Cappella Brancacci, situated in the right wing end of the transept, was built in 1386 at the wishes of Antonio Brancacci. Beginning in 1422, the frescoes on the walls were commissioned by Felice Brancacci, an important political bigwig in the Florence of the early 1400’s and patron of the Cappella. 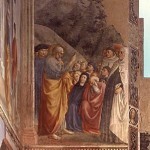 Felice Brancacci entrusted the decoration of the chapel to Masolino and Masaccio in February, 1423. Masolino was forty and Masaccio twenty-two in that year. At that time, they already appeared to be a noted duo, enlivened by a great affinity and by complementary styles. 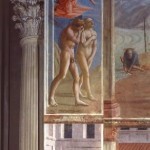 However, the frescoes by Masolino and Masaccio remained unfinished for reasons still not clear. 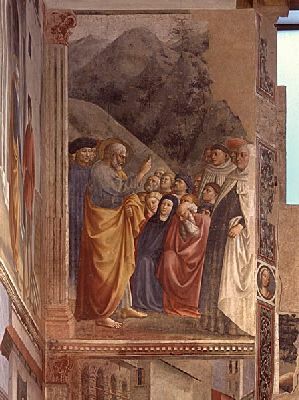 They were reworked following the fall from grace of their client (1436): the figures of all the personages who could have any connection with the Brancacci family were erased. The restoration and the completion of the missing stories and personages was the work of Filippino Lippi, between 1481 and 1482. The cycle of frescoes on the long walls of the Cappella Brancacci narrates some episodes in the life of Saint Peter, preceded on the entrance jambs, by the Original Sin and the Expulsion Of Adam and Eve. The connection between the two parts is clear: the sin of man is the necessary prologue to explaining the salvation function of the apostolic preaching. 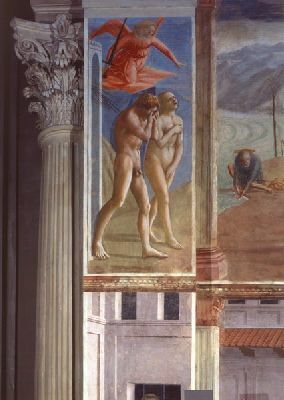 Next to the elevated pictorial quality of Masolino’s work, the frescoes reveal all of Masaccio’s greatness in the perspective rigor of the scenes and the volumetric power of the figures: the most renowned ones being the dramatic Expulsion from Paradise and the Tribute Payment episode. These works of art inspired all the Florentine artists of the 1400’s. Finally, there are: the Madonna of The People, a panel from the second half of the 1200’s, on the chapel altar; the Madonna of the Carmine by Vincenzo Meucci, in the large lunettes of the vault, and then some frescoes from1765, where the Evangelists and other Episodes in the life of Saint Peter by Masolino had previously been. Size: 247 cm. x 591 cm. To describe what the evangelist Matthew recounted, Masaccio used a “figurative history”. 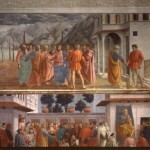 The fresco, apparently composed of a single scene, can be divided into three parts. Christ with the Apostles dominates the middle scene. To the left, Peter is seen on the shore of the Sea of Galilee; to the right, he is depicted paying the tax. 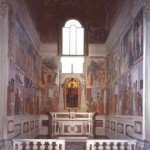 The Brancacci Chapel is one of the noblest examples of Renaissance painting. It is the result of a partnership between two of the greatest artists of the period, Masaccio and Masolino da Panicale, with the help of Filippino Lippi, who was summoned to complete the work. The fresco cycle as well as the choice of the theme was commissioned by Felice Brancacci. The cycle’s theme is humanity’s salvation wrought by the Lord through Peter. In this work, Masaccio reworked references to classical art. The pair is firmly positioned on the ground, on which the shadows of their bodies shaped by the intense light are projected. Their gestures are laden with emotion. The weeping Adam covers his face with his hand as a sign of shame; Eve covers herself with her arms and wails, in a sign of pain. Size: 247 cm. x 168 cm. This scene is located on the second register to the left on the back wall of the chapel. It demonstrates a stylistic change in keeping with Masaccio that gave the work a surprisingly solid view and perspective layout. The figures of Saint Peter and the bystanders are monumental, lean, and statuesque. The spatial organization shows the effects of the painting’s new humanistic spirit, which paved the way to the true Renaissance. By car: Upon arriving in Florence, follow the signs for Porta Romana or Palazzo Pitti. Reservations are free and recommended every day from 9.00 a.m. to 6.00 p.m. – Mid-week holidays: 9:00 a.m. to 2:00 p.m. Weekdays (Closed on Tuesdays): 10-5 p.m.
Sundays and mid-week religious holidays: 1-5 p.m.
up to 18 years, groups of students and their teachers, tour guides and interpreters, differently abled and their escorts, members of ICOM, ICOMOS and ICCROM. School classes are required to submit the list of names on the school’s letterhead.